I was scheduled to only work until 3pm today, so of course, my afternoon plans involved being on a bike. The question was, where? 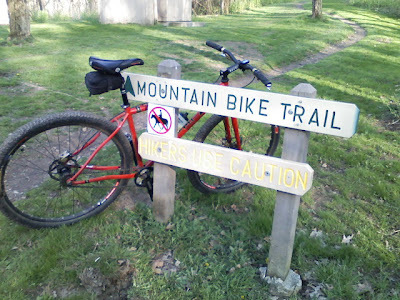 Fortuitously, a customer mentioned that he had been at Quail Hollow State Park earlier, and the trail was dry and in fantastic shape, so I grabbed my Raleigh XXIX and went to Hartville, or as we like to say, headed down "ta tha Holler." During my drive, I had that familiar, nagging feeling that I was forgetting something. I went through the mental checklist...bike, front wheel, helmet, shoes, gloves, sunglasses...but came up with nothing. When I get to the trailhead, the first thing I usually do is air up my tires. Hmm...no floor pump! I had my emergency mini-pump, but it doesn't have a pressure gauge, and it's hard to tell by feel whether or not your tires are at the optimum pressure. Just then, two guys pulled into the lot next to me. I asked to borrow a pump from them, but they only had a mini-pump as well. Then a guy came in from riding the trail, so I asked him. Turns out, he was parked on the other side of me, and did have a floor pump which he got out and let me use. His name was Matt, and he also had one of our "Define your life. Ride a bike." stickers on his vehicle. Thanks, Matt! As my first real mountain bike ride of the season, the trail at Quail didn't disappoint, and I made it for four laps around the 3-and-a-half-mile loop. Afte my third lap, I met another guy, Chad, at the trailhead, so we agreed to ride our final lap together. He gave me a real run for my money during the first half of the lap, but as he admitted, he wore himself out too soon, and was chasing after me for the second half. Thanks, Chad, for a good ride. As I've mentioned elsewhere before, this is a great trail to develop and hone your skills if you're a beginning mountain biker. If you're a veteran, it's a great place to do a few laps and test how well your fitness has held up over the winter.